This is more of a tip than a recipe. I love tender slices of chicken breast, which can be used for chicken parmesan and other dishes. Of course, grocery store chicken breasts can be pretty tough. To get them really tender, I first slice the breasts thinly, then pound, then soak in kefir (buttermilk or regular milk would work, too) for 30 minutes or even leave them overnight. Before cooking, I usually dip them in egg and milk, then into a plate of bread crumbs or flour mixed with spices (the lighter pieces in the photo were dipped in flour and the orange pieces were dipped in store-bought bread crumbs). 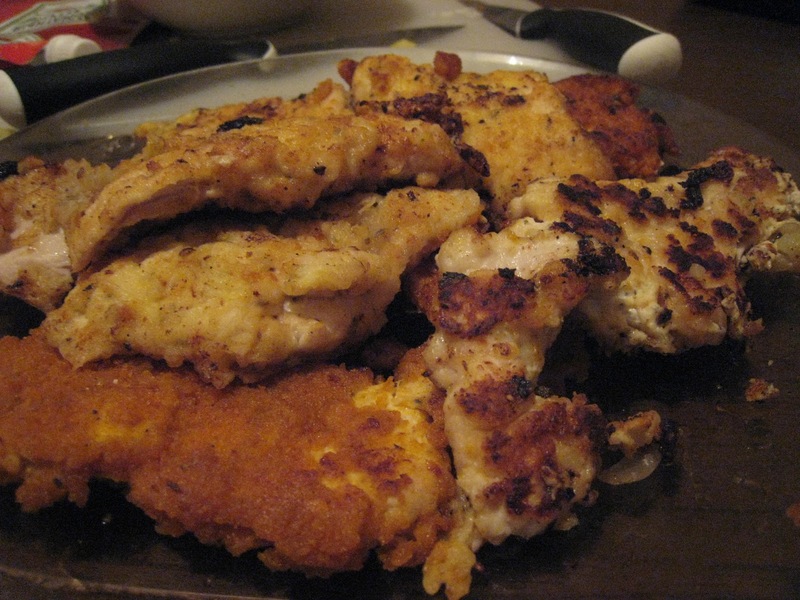 See ranch chicken, which is a nice flavor combination. Could be baked as a healthy alternative. What exactly is кефир? I've always wondered that when I see it at the store. Plus, it would be handy to have some guide to all the percentages on the dairy products -- what each can be used for! Okay, kefir is a sour milk product that tastes like buttermilk. It is supposed to have live "cultures" like in yogurts like Activia. They are supposed to be really good for your gut and overall health. It's not hard to digest like other milk products. I even do a face mask sometimes and it seems really nourishing. As to the percentages...I usually buy a higher percentage because I need to gain weight...however, the higher percentages are more expensive. In general the sour cream and yogurt that have higher percentages of fat will be thicker, so plan accordingly.